President Donald Toddler‘s war against the media—virtually every outlet of which he’s deemed fake news, save for the “irreproachable” Breitbart and Fox News—will be fought with one less Republican on its side. Former president and current Bob Ross wannabe George W. Bush doesn’t think No. 45 should be so quick to attack journalism (yes, the institution, not just the individual reporters). 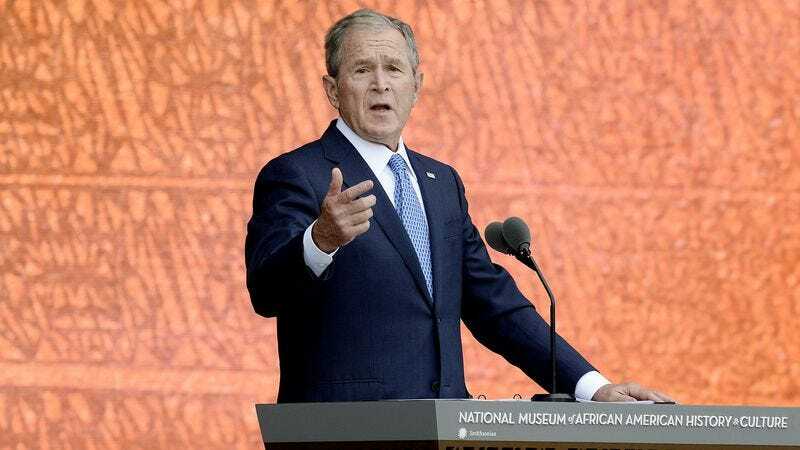 Bush the younger had a contentious relationship with the media during his administration, but he appears to have mellowed with age, to the point that he not only enjoys playing with ponchos in the rain, but he believes that the fourth estate keeps the government honest. You can watch the whole interview below, which sees Bush weigh in on the Russian leaks and Trump’s Muslim ban.